Description: Squared brown bottle for "chocolate" milk with a round top. Has a diagonal mold seam acorss the bottom. Measures 4" tall, 1-9/16" wide, 1-9/16" deep. Description: Plastic milk bottle that makes a "MOO" sound when turned over. 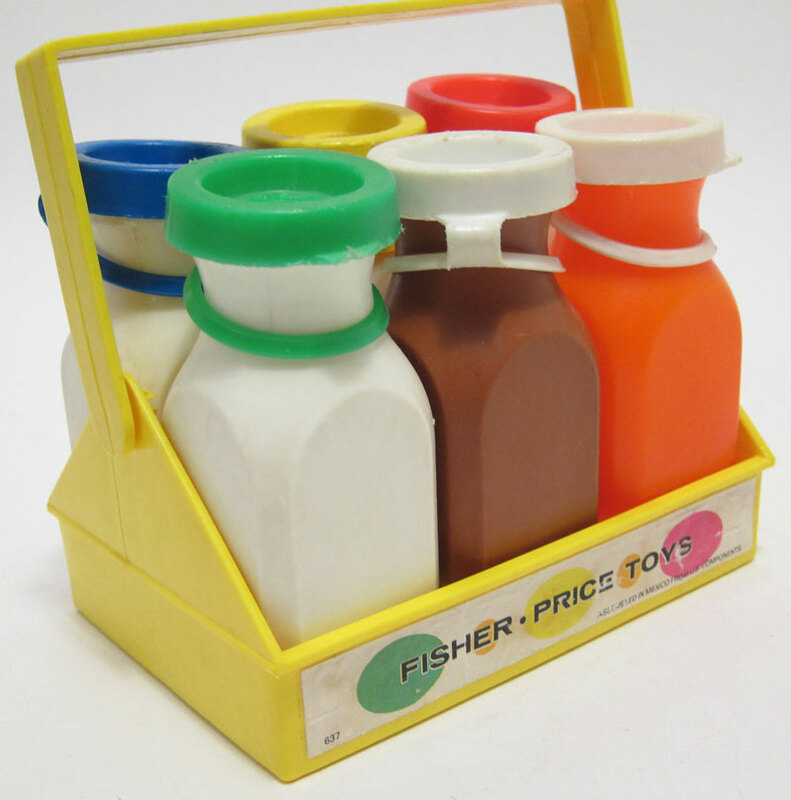 The bottle has a paper litho on the front with a cow's head and the words "Fisher-Price" and "Moo Sound Milk Bottle". The bottle appear to be half-full with a clear plastic top and white bottom half. Measures 7-1/4" tall, 4" wide, 4" deep. Description: Frosted transparent plastic Milk bottle with a litho on the front of a cow standing in a pasture wearing a cowbell and a blue ribbon. 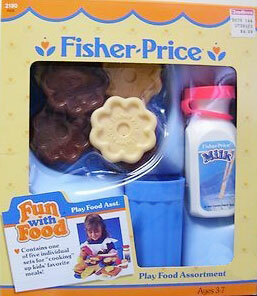 The words "Fisher-Price" are written below the picture of the cow. The milk bottle has an attached yellow flip-off cap with an imprint of a smiling sun in the center. Description: Squared orange bottle for "orange juice" with a round top. Has a diagonal mold seam acorss the bottom. Measures 4" tall, 1-9/16" wide, 1-9/16" deep. Description: Squared purple bottle for "grape juice" with a round top. Has a diagonal mold seam acorss the bottom. Measures 4" tall, 1-9/16" wide, 1-9/16" deep. Description: Squared red bottle for "fruit punch" with a round top. Has a diagonal mold seam acorss the bottom. Measures 4" tall, 1-9/16" wide, 1-9/16" deep. Description: Turquoise rectangular lift-out bottle carrier with a 1" raised edge and a hinged carry handle on top. 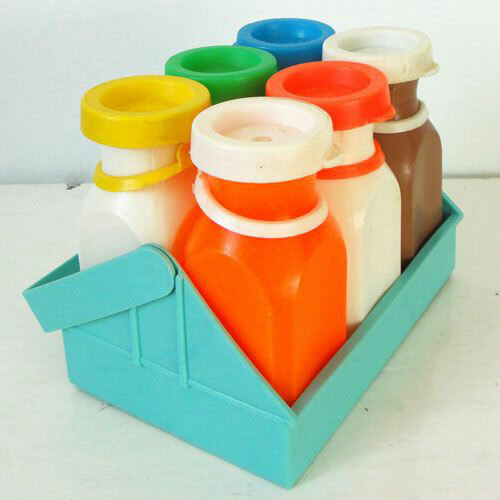 Holds six 4" tall, 1-9/16" wide, 1-9/16" deepplastic milk bottles. Measures 5-3/8" long, 3-3/4" deep, 5-1/8" tall. Description: White milk bottle with a blue push-down top that makes a squeeking noise when pressed. 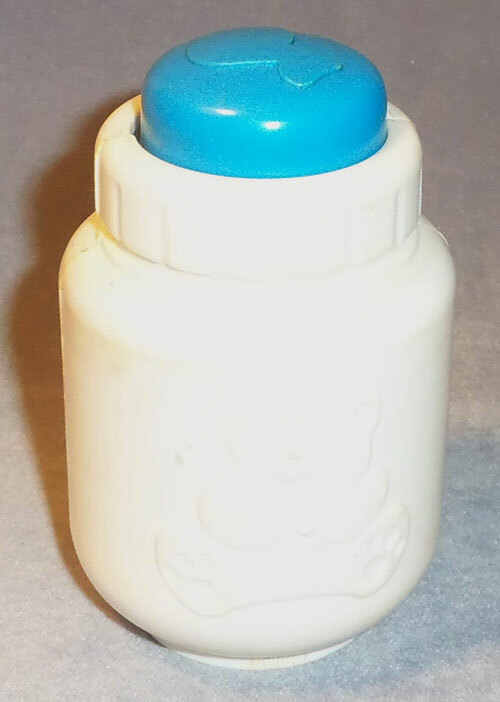 The side of the milk bottle is marked "Fisher-Price" on one side and has a teddy bear imprint on the other side. Measures 3-1/2" tall x 2-1/4" diameter. Description: Squared white bottle for "regular" milk with a round top. Has a diagonal mold seam acorss the bottom. Measures 4" tall, 1-9/16" wide, 1-9/16" deep. Description: White bottle for "regular" milk with a blue litho on one side. The litho has a picture of a glass of milk with 2 red and white straws in the glass. 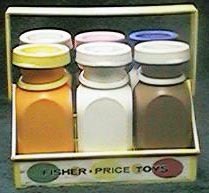 The litho is marked "Fisher-Price MILK" across the top in white. 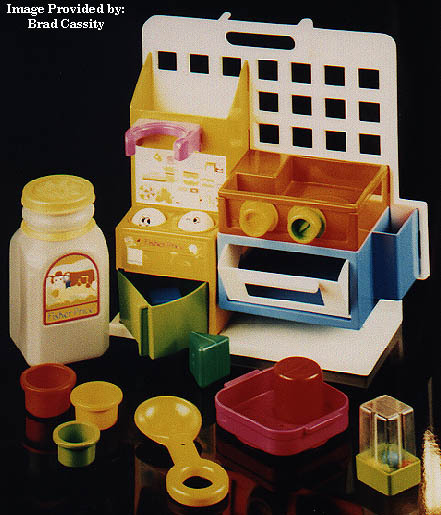 Description: Yellow rectangular plastic milk carrier with 2 triangular end sides that have an attached carry handle on top. The inside of the carrier has 6 divided slots that holds 6 milk bottles. Measures 5-5/8" long, 3-1/2" wide, 5-1/8" tall with handle upright, 2-3/4" tall with handle down. Description: Squared yellow bottle for "lemonade" with a round top. Has a diagonal mold seam acorss the bottom. Measures 4" tall, 1-9/16" wide, 1-9/16" deep.